Many definitions and descriptions of polished concrete exist, but they all revolve around two fundamentals: mechanical processing and chemical densification. A polished concrete finish is achieved through a process of mechanical diamond grinding, honing, and polishing, utilizing a series of subsequently finer grits combined with chemical densification to produce a light-reflective, durable, and relatively easy to maintain surface. The concrete industry is able to offer this architectural finish in a multitude of settings architects, designers, and owners may desire for providing exceptional value and enhancing buildings’ esthetic appeal. Additionally, polished concrete floors do not contain volatile organic compounds (VOCs) and reduce lighting requirements and energy costs associated with climate control by leveraging concrete’s positive thermal mass properties for natural heating and cooling. Figure 1: Colour variation from hand-finishing of slab at corners. Despite the widespread use of polished concrete, a successful outcome with it in new construction is still unpredictable. Hence, some building professionals hesitate to employ it in their projects. Unique to this floor system is the long line of tradespeople involved with the process, including general contractors (GCs), ready-mix suppliers, and concrete placers, finishers, and polishers. This division of responsibility can cause problems with the final result. In the following paragraphs, this author explores some common issues polishing contractors tend to see or hear about from clients or designers. Today, the concrete polishing process is relatively repeatable given certain criteria. In terms of concrete floor slabs, however, it can still be difficult to achieve the consistency conducive to polishing. Many of the issues are directly related to the slab itself. As the pouring of concrete is irreversible, some polishing projects are left with permanent reminders there is room for development. The process of improvement starts with recognizing the issues and their causes, refining specification documents to reflect current best practices, and educating the project team on how mix, placement, finishing, curing, and, finally polishing, can affect the overall slab appearance. 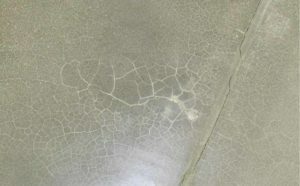 Figure 2: Floor slab exhibiting differential curing marks. The curing cover likely had trapped air when applied. Problems can occur on polishing projects with a specified or desired amount of aggregate exposure. A lumpy floor slab without a good flatness tolerance can result in inconsistency in this area after the polishing process. This situation presents as either too much aggregate exposure (larger stones) or too little (pockets of cream [i.e. areas only containing cement paste and very fine sand particles]). It should be noted aggregate exposure in concrete polishing will always have some variability. However, high degrees of exposure inconsistency are not esthetically appealing and can be a major source of contention when the polishing work is complete. The root causes of aggregate exposure issues are mainly related to slab placement or finishing and include low floor flatness (FF), curled joints, inconsistent placement leading to aggregate stacking, and issues with screeding. FF tolerances impact the esthetics of polished concrete floors. They should be measured in accordance with ASTM E1155, Standard Test Method for Determining FF Floor Flatness and FL Floor Levelness Numbers. One should specify FF 50 or above when laser screed or other tools and techniques are available for pours larger than 1858 m2 (20,000 sf). 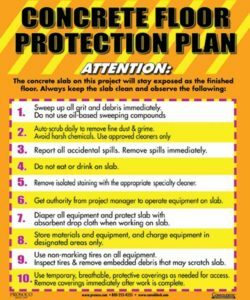 An FF of 35 should be specified for retail or light commercial applications, grocery stores with drains and penetrations, or buildings with multiple small pours (Read “Specifying The Concrete Slab” by Todd Scharich, Chad Gill, PE, Steve Lloyd, Pat Harrison, and Bruce Suprenant, PE, PhD, FACI, published in the August 2016 issue of The Construction Specifier.). In addition to calling out FF numbers, the specification can also outline areas of concrete placement that will improve the consistency of aggregate exposure. Figure 3: Power trowel debris scars. Provisions should be made to ensure placement of an architectural floor slab does not interfere with a successful install. For example, it is advisable to outline the requirement to call off a pour if conditions are too cold, wet, or hot or if the building envelope is insufficiently sealed. It is recommended to deposit concrete in a continuous operation. This approach does not result in coarse aggregate segregation. Whether placing by chute, buggy, or pump, the key is to be aware consistent and continuous delivery provides the best slab consistency. It is recommended to screed slab surfaces with a vibratory straightedge and strike off to correct elevations. Sufficient paste is necessary at the surface for polishing, which is best accomplished by using a hand-held vibratory bullfloat, vibrating screed, truss screed, or laser screed. The vibratory screed must be moved continuously across the slab because too much vibration at one location drives the coarse aggregate deeper into the slab. This results in variations in coarse aggregate exposure after polishing. The maximum contraction joint spacing should not be more than 24 times the slab thickness or 4.5 m (15 ft), whichever is smaller. This limit is set to not only control out-of-joint cracking, but also minimize slab curling. If the slab edges curl, the grinding and polishing will expose more coarse aggregate at the corners. The engineer should determine the maximum contraction joint spacing to minimize both cracking and curling. Figure 4: Concrete cap delaminating from entrapped air. Colour variation in a concrete slab can occur for several reasons and can detract from the overall look of a polished floor. Materials used for making the concrete can lead to inconsistencies in the final look of the slab if care is not taken to ensure all loads have the exact same materials. The floor slab can exhibit colour variation if batches vary. Supplemental cementing materials such as slag or fly ash can also lead to colouration issues with the surface of the slab. The concrete slab for polishing specification can include instructions stating one must obtain each colour, size, type, and variety of concrete material and mixture from a single manufacturer with the resources to provide cast-in-place concrete of consistent quality. This source-limitation requirement is similar to the one specified for architectural cast-in-place concrete. Many ready-mix suppliers have quality control (QC) systems at both batch plant and field delivery that, if required, can be implemented into the floor pour plan to provide batch consistency. allowing zero or limited replacements for Portland cement (e.g. slag and fly ash) as supplemental cementing materials can affect colour and curing (For more information, read Paul Jeffs’ article, “Producing Quality Polished Concrete Floor Slabs,” in the May 2016 issue of Construction Canada). In this author’s experience, a common issue is colour differential in areas such as the perimeter of a slab, cold joints (where a pour ends and a subsequent pour starts), and slab penetrations. The reason for this differential is relatively simple. Finishing operations on the main body of the floor slab are carried out with a large ride on a trowel machine. This creates a consolidated dense surface. If perimeter areas and cold joints are finished by hand, they have a different density and show up as lighter than the main body of the floor. Even after grinding and polishing, this colour difference shows through (Figure 1). The document should also outline the finished slab surface shall be free of trowel/burn marks and mottling as this will affect the uniformity of the final appearance. The strategies to achieve this should also be reviewed at the pre-pour meeting. Figure 5: Example of a floor-protection plan onsite. Colour variation can also result from the way a concrete slab is cured. 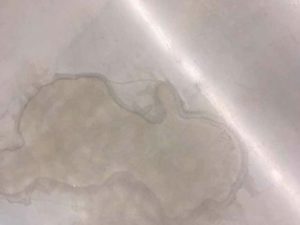 Sometimes referred to as hydration marks, the discolouration of the slab is usually the result of inconsistent curing methods or material application. In a ‘wet’ cure scenario, hydration marks show up as lines or pockets of dark and light. This is caused by either a lack of water at the time of covering material application or by failure to place the material flat and free of air pockets. Colour variation can also occur if the curing covering material is disturbed or blows away partially during the slab hydration period. Curing a concrete slab with film-forming liquids can cause colour problems if the film application is not done with care and consistency. When the application of a curing membrane is uneven, the resulting concrete floor can exhibit a permanent spotty or ‘leopard’ appearance (Figure 2). Further issues can result from leaving concrete machine tools on the slab after finishing (e.g. the dreaded ‘helicopter mark’). Additionally, the early placement of construction materials can leave hydration marks where skids or wood cribbing interfere with or disrupt the hydration/curing of the slab. It should be noted the hydration marks developed during the curing process are permanent and cannot be removed by grinding and polishing. 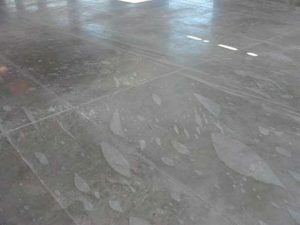 It is necessary for the slab-polishing specification to outline the curing of the concrete floor and the method to be used with emphasis on the need for consistency. It must also include the requirement of not storing construction materials on the surface. This author’s experience indicates employing a moisture-retaining cover for seven to 10 days is the optimal way to cure newly placed concrete meant for polishing. This method reduces shrinkage and map cracking, helps concrete gain strength, and eliminates the addition of chemicals that could impede densification or the introduction of colour. Figure 6: This image shows polished concrete floor systems cannot be considered stainproof. During the concrete finishing process, careful attention is required to ensure residual buildup on finishing trowels is removed. Scarring can occur if residue builds up and falls back on the slab surface. Finishing scars have some depth and an associated colour differential. These blemishes cannot be rectified (Figure 3). The polished slab specification must also include a requirement for a pre-pour meeting attended by the concrete contractor, ready-mix producer, polishing contractor, testing agency, construction manager, and representatives of the architect, engineer, slab consultant, and owner. This meeting stands above all other recommendations as it ensures all players in the line of the floor slab creation and polishing are present and have an opportunity to review expectations, make recommendations, and create awareness. Further, key parties such as the concrete finisher and polisher will have an opportunity to offer input on how issues like surface defects can be avoided. At the extreme end of the spectrum of surface defects are weak slab surfaces that can be the result of several issues, such as rain damage, air-entrained concrete mix, and carbonation. When defects occur with the integrity of the concrete cap itself, serious problems are at hand. A delaminating cap cannot be polished and would need remediation. If the cap is rain damaged or carbonated, it should be ground down to a point where a suitable wear surface can be salvaged. Any of these scenarios and their associated ‘fixes’ would have serious cost implications and would alter the design intent of the polished floor (Figure 4). Surface crazing of the concrete slab can occur when the slab is subjected to rapid drying, crusting the top while the lower layers are still in a semi-plastic state. Failure to monitor the curing system is the root cause of this surface defect. Avoiding this condition means adherence to a curing plan outlined in the slab-polishing specification as previously discussed. 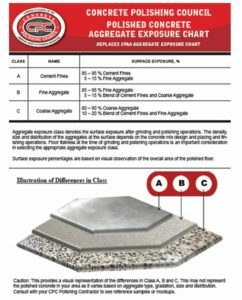 Figure 7: The Concrete Polishing Council’s (CPC’s) aggregate exposure chart with the different categories. The optimal specified compressive strength for a polished floor is between 25 and 32 MPa (4 and 5 ksi)—strong enough to polish in a month, but not so heavy as to slow polishing progress and grow costs. Further, air content of trowel-finished floors must not exceed three per cent as higher air content increases the risk of blisters and delamination in a trowel finish. These criteria can be included in the concrete slab specification along with the requirement of only executing the floor pour when building and weather conditions are conducive to success. Surface defects can also occur well after a slab has been placed. Other construction activities, such as dropped materials or tools, rusty metal pipes, and leaky oil bottles, can create damage. Owners are rarely pleased when this type of issue shows up in a polished floor. While there are techniques and materials to deal with these problems, there is a cost associated with them and the remedies are not always invisible. Concrete Polishing Council (CPC) guidelines recommend protecting the concrete slab in accordance with the slab-protection provisions in MasterFormat Section 03 35 43, “Polished Concrete” (it should be noted there are no provisions in Section 03 30 00 for slab protection. Additionally, since no polishing association currently exists in Canada, the Concrete Polishing Council [CPC], part of the American Society of Concrete Contractors [ASCC], is regarded as the primary source of concrete polishing guidelines and specification information.). As this involves the activities of other trades, the protection falls to the construction manager, who must be made aware of its importance (Figure 5). using consistent patterned machining techniques. The main objective of every professional concrete polisher is to leave the finished slab free of machining marks. 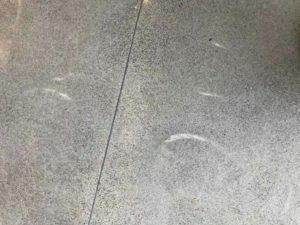 Tooling marks from the grinding process can show up in the floor when good techniques are not utilized or if diamond grits are skipped or rushed. This can be as minor as a few wisps in the floor or ‘corn rows’ of machine-tooling lines that were not cancelled out. With both shine issues and tooling marks, the remedy is always rework to improve or remove. Figure 8: Trigloss or distincition of image (DOI) meter. The final category of concerns involves wear or damage from use. Polished concrete is a great floor system, but it does have limitations—it is not a coating and is therefore permeable. While advancements in stain protection have been made, polished concrete at this time is not stainproof (Figure 6). Further, polished concrete is susceptible to chemical attack. De-icing salts, acids, and oils will penetrate the polished surface, remove shine, and, in the case of prolonged exposure, cause degradation. It is important to note polished concrete will not perform well or provide value over time in areas such as outside entry vestibules (depending on geographic location), emergency service vehicle parking bays, and wash bays. The long-term use of any space should be considered when choosing polished concrete as the floor finish. A high-traffic public corridor near street access will see a loss of shine or damage to the polished surface if floor maintenance and engineered environmental controls are not considered and implemented. You May Also Like Do you know what's in your concrete? A more robust option would be to include all items pertaining to maintenance in their own section. 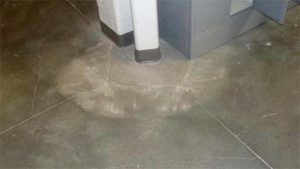 For example, MasterFormat Section 03 01 30, “Maintenance of Cast-in-Place Concrete,” could include an outline for daily, weekly, and extended polished floor care. Figure 9: CPC polished concrete appearance chart. When specifying polished concrete, one is outlining to the long list of professionals what the final vision for the floor surface is, how it should be achieved, and what everyone’s role is. Concrete suitable for many floorcovering materials is usually not appropriate for polishing. In the past, specifiers and owners have often delayed selecting floorcoverings or other treatments until after the concrete contract is signed or even after the concrete is placed. This approach does not always work for polished concrete. As mentioned earlier, floor slabs for concrete polishing require special attention if they are to meet an expected outcome. Failure to recognize and address this fact can spell doom for a project even before the polisher gets to the site. • Section 03 35 00, “Cast-in-Place Concrete,” for concrete designated as polished concrete. • Section 03 35 43, “Polished Concrete Finishing,” can then be cross referenced. There are three to four categories of polish as defined by the amount of aggregate exposure in the concrete surface (Figure 7). Outlining the desired level of aggregate exposure in the project documents is a crucial component of a polished concrete specification. In the world of concrete polishing, the largest cost input is labour. Requirements for exposing more or larger aggregate will see a corresponding increase in cost. Defining the exposure class for the floor project will ensure the bids are aligned with what is desired. For the last 20 years, the main method of describing polished concrete gloss levels has involved using an expression of diamond grit and/or calling out shine levels—level 1, 2, or 3. While this has been useful and tells the polishing contractor where to stop in the sequence, the end results are not always predictable. 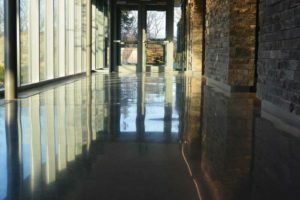 The final gloss appearance can vary widely from floor to floor, installer to installer, or between diamond-tooling manufacturers (Read Christopher Bennet’s “Taking the Measure of Polished Concrete.”). In recent years, technology has made it possible to measure the refinement of the polished concrete by using instruments to evaluate the surface during and after the process. The first type of instrument was a gloss meter to measure reflective sheen. Values for different floor gloss levels could be set and achieved. 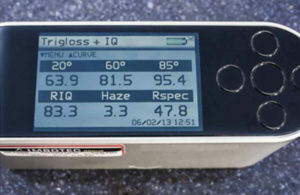 While this was an improvement, gloss meters do not measure the refinement of a surface and can be fooled by surface coatings. The next evolution in measurement was a clarity meter (Figure 8). It measures specular gloss (reflectivity), but most importantly, it measures DOI, otherwise known as reflective clarity. This measurement cannot be fooled by the use of coatings and will only measure in higher values if the concrete surface has been properly refined. 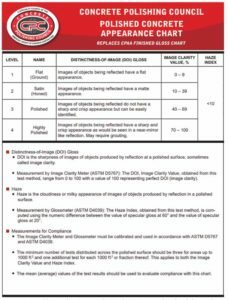 Levels of sheen and corresponding clarity values have recently been organized into a very useful chart by the CPC. The chart can be used for both specification and QC purposes (Figure 9). Another method of measuring surface refinement in polishing has now emerged. Ra has become an additional tool with which polished levels can be specified and measured (For more details, refer to Andy Bowman’s article, “Concrete floors: Does “sealed” mean the same things as ‘polished’?” in the October 2016 issue of Construction Canada.). Even when a good refinement specification is included in bid documents, it is advisable to include a provision for a mockup of the polished floor to be installed as per specs for review by all parties. The final gloss is a relatively easy parameter for an experienced polishing contractor to change and adjust onsite if the design team changes its mind. An onsite sample between 10ms and 20ms will give a reasonable representation of the final floor. The overall success of a polished concrete project requires at a minimum an awareness between the divisional parties of what the final expectation is and what can be done to meet it. As the polished concrete industry has evolved, an abundance of specification material and information about polished concrete has been generated from both associations and manufacturers. The key is the desire to bring the existing body of knowledge to bear on a project through recognition, sharing, and the ongoing process of creating effective project documents. Paul Giangualano is general manager of BNE Contractors. He has more than 14 years of experience in the concrete polishing and resinous coatings industry. 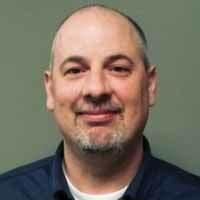 Giangualano has previously served as installation foreman, project manager, and operations manager. He can be reached at paulg@bnecontractors.com.